Along with Darabont’s departure comes news of Emily Blunt (Into the Woods) being in talks to star as a villain in The Huntsman, although neither Universal nor Blunt has confirmed this. The Edge of Tomorrow actress is reportedly in negotiations to star as the “evil Snow Queen who’s set on avenging her sister Ravenna’s death.” Theron and Hemsworth are set to reprise their respective roles. The sequel, which at one point was going to be a prequel, will see “the Huntsman on a quest to find the magic mirror (which has been stolen), forcing him to face not only his past but the evil Snow Queen who’s set on avenging her sister Ravenna’s death.” The script currently in play was written by Darabont (with earlier drafts by Craig Mazin and Evan Spiliotopoulos); no word yet if the script will be revised by other writers. Soon after its June 1, 2012 theatrical release, Snow White and The Huntsman hit #1 at the box office and Universal revived its plans for a sequel, with director Rupert Sanders in talks to return (Stewart and Hemsworth were already optioned for two more sequels). A few months later, Universal switched gears away from Snow White to focus the follow-up on Hemsworth’s huntsman character after they axed Stewart from the sequel following her affair with the married Sanders (the young actress was in a long-term live-in relationship at the time with her Twilight co-star Robert Pattinson). Snow White and The Huntsman has gone on to gross nearly $400 million worldwide. 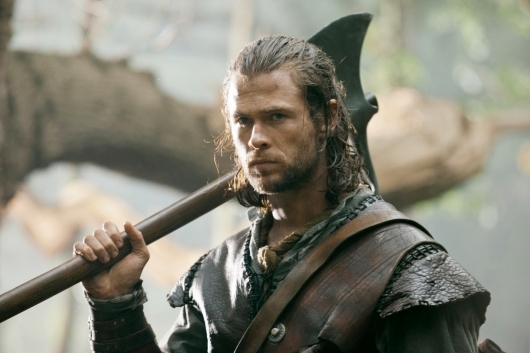 Its sequel, The Huntsman, is scheduled to hit theaters on April 22, 2016.